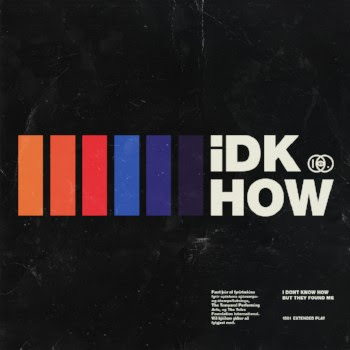 iDKHOW are set to release their debut 6 track EP 1981 Extended Play via Fearless Records / Caroline Australia on November 9th. After digging through hours of archival footage, they can finally unveil the original video for first single ‘Do It All The Time’. Part archeological excavation and part forward-thinking vision, I DONT KNOW HOW BUT THEY FOUND ME is as Day-Glo nostalgic and optimistically futurist as Back to the Future, the cinematic classic in which their band name was born. Doc Brown utters the famous line just before telling Marty McFly to “run for it.” And just as Marty traveled 30 years into the past and righted the wrongs of the present, so have Dallon Weekes (vocals, bass) and Ryan Seaman (drums), resurrecting the songs and innovative spirit of iDKHOW for a new generation starved for creative risk taking and unbound joy. iDKHOW’s music is from a time when iconoclastic pop trailblazers broke through commercially without compromising artistically; those who didn’t succeed despite creative courage but because of it. iDKHOW channels the legendary spirits of sixties garage, seventies glam, eighties new wave, and the early days of Britpop, merging the greatest strengths of bygone eras into a transcendent sound of the future. Imagine a nightclub powered by T. Rex, Bowie, Oingo Boingo, and Tears For Fears, distilled into pop rock anthems that are as instantly memorable as they are timeless. The frontman has plenty of experience with the potential for a great song to move crowds, propel late night drives, soundtrack makeups and breakups, and to top the Billboard charts. As bassist/backing vocalist for Panic! At The Disco from 2009 to 2017, Weekes co-wrote massive hits “This is Gospel” and “Girls/Girls/Boys,” and is credited on nearly all of the songs that comprise Too Weird to Live, Too Rare to Die!. When Weekes discovered these “lost” recordings, this forgotten band, he knew Ryan Seaman was the perfect drummer to help him reignite the iDKHOW aesthetic. The resurrection of iDKHOW’s forgotten music arose organically, through word of mouth, social media, and increasingly larger pop-up shows along the West Coast. Soon, the iDKHOWrevolution was undeniable, as evidenced by the over 10 million YouTube views, and over 10 million streams they amassed of self-released songs like, Choke, Modern Day Cain, andNobody Likes the Opening Band. Now partnered with label Fearless Records, iDKHOWcontinues to mount an assault on the vacuous nature of fake relationships and the dirty underbelly of Hollywood glitz. A band once so elusive that, whenever asked about playing shows in secret, would deny the band even existed at all, iDKHOW made their UK live debut at Reading and Leeds festivals this year, followed by 3 sold out UK headline shows in venues that needed to be upgraded various times. They are set to go on tour in the US with Waterparks in November.